I have been experimenting with jeans lately, this one I thought I would share.Crosses have become very popular, so why not update your old denims with this look..
1/ measure & cut your back jean pocket with a piece of paper. 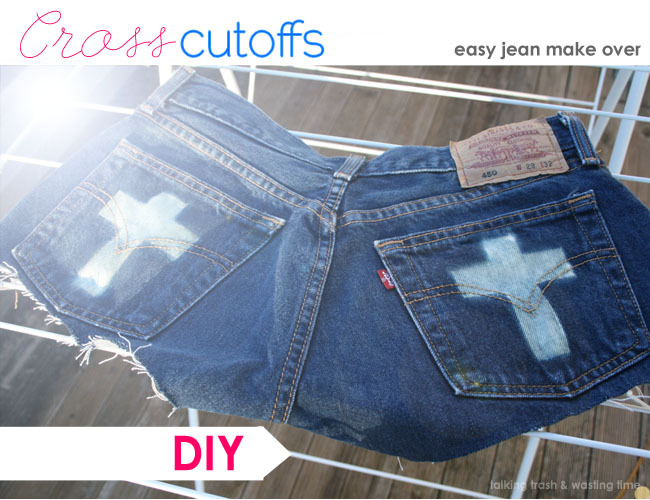 Fold in half and cut your cross out. You could do a normal cross or a inverted cross, whichever you prefer. 2/ Place your paper template over some plastic clear book cover contact and trace out the cross and pocket shape. Cut 2 templates remembering to flip the paper so it fits both pockets. 3/ cut each cross out. 4/ peel and stick the plastic down on each pocket, you can use the marker marks to get even and center. 5/ take shorts outside and lay flat. Spray with pure bleach in the cross cut-out. Do not spray too much otherwise the bleach could bleed under the plastic. You could even sponge the bleach on if you like. 6/ leave to let bleach work its magic. You must check regularly until you get the desired result. All denim takes different amount of time to lighten so just keep checking. 7/ peel off plastic and wash.
Love the result!!! Your blog is so great, following you! New follower on Pinterest, Twitter, Fashiolista, Tumblr and GFC: your blog is inspiring and amazing! xoxo Mina. Woahhh, great DIY. This looks so professional.